The Nigerian Union in South Africa has reported new xenophobic attacks against Nigerians and other foreigners in Sternkopf, Namakwa Municipality in the Northern Cape Province of South Africa. The president of the union, Ikechukwu Anyene, said yesterday in Pretoria, that the Northern Cape Province chapter chairman of the union reported the incident to its national secretariat, a day after the union led other Nigerians to meet with President Muhammadu Buhari, who was in South Africa for the African Union Summit. “The National Secretariat of Nigeria Union has received a report of xenophobic attacks from Mr. Kennedy Osagie, the Northern Cape Province chapter chairman of the union. 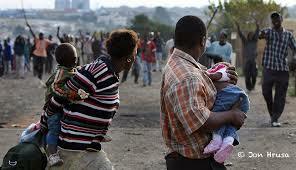 “The report indicated that South Africans attacked Nigerians. “Two cars belonging to Nigerians have been reportedly burnt and they have been going from house to house looting and destroying their property,” he alleged. Anyene, who said that there were 20 Nigerians living in the affected community, added that none had been reported dead in the incident, reported the News Agency of Nigeria. “Six Nigerians have taken refuge with their families in nearby SpringBok community and they do not know the whereabouts of the other Nigerians,” he said. He said that the union had reported the incident to the Nigerian Consulate in South Africa. Nigeria’s Consul General in South Africa, Ambassador Uche Ajulu-Okeke, confirmed the incident, saying the mission had commenced investigations. “The Nigerian Consulate in South Africa has received a report of new xenophobic attacks in Northern Cape Province of South Africa. “The mission has commenced investigation into the incident and will ensure that Nigerians are safe in South Africa,” she said. South Africa was hit by a wave of deadly xenophobic attacks between March and April 2015, with locals attacking and killing at least five African migrants. The tension subsided after widespread condemnation. The report on the attacks came on the heels of Buhari’s interactive meeting with the Nigerian community in South Africa on Monday.